Autumn is just around the corner and I already have fall on the brain. I've been looking through my closet for outfit ideas as well as combing through Pinterest and fashion blogs I follow and have found a few key items that I need in my fall wardrobe. Fall is my favorite season. I love everything about it. Honestly, I personally think that fall fashion is better than all the other seasons. I love boots, sweaters, and jeans. To me, its all about comfort and staying cozy. 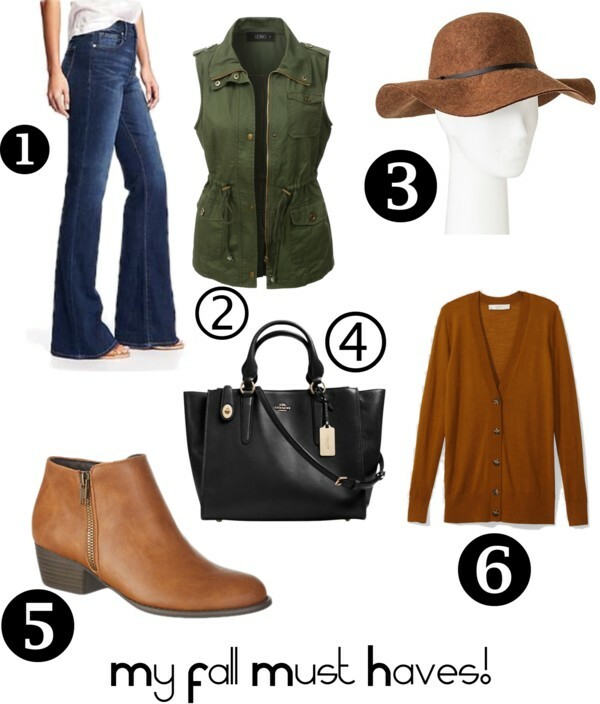 These are my six fall must haves that every woman needs in her wardrobe. Yes, flares. I haven't had a pair since '09 but find myself really wanting them. I have checked a few stores but haven't had any luck. I feel that flares are a classic style and can be dressed up with a pair of heels or dressed down with boots or wedges. Old Navy is my favorite place to buy jeans and they have a lot of flares right now. I have both of these in my closet. Pair it with a basic white tee, skinny jeans, and boots and your good to go. Toss it over a dress with knee-high boots for work. I found my military vest at Ross for less than $20 and I absolutely love it. Yup, I need one. It rains a lot her in Portland so it makes sense. I'm still deciding between black, wine, or cognac but I will rock a floppy hat this season. I just donated all my old black purses and have been on a hunt to find a replacement. I feel in love with Coach's fall collection. The shape is perfect and it comes in a bunch of different colors. A girl can never go wrong with a classic black bag. I have yet to have a pair of cognac boots in my closet. They are perfect for work and the weekends. They can be worn with jeans, leggings, skirts, and dresses. I have silver, black, and tan in my closet but cognac will be joining them soon. I love sweater weather! Recently I have purchased pumpkin and burgundy cardigans. A girl can never have too many sweaters right? They are fall staples and spruce up every outfit. Throw it over a dress with tights and leggings or wear it with an oversized tunic and boots. I have a lot of sweaters. I suggest that every woman needs neutrals like black, gray, and cream in their wardrobe as well as a few autumn hues like burgundy, olive, or camel.